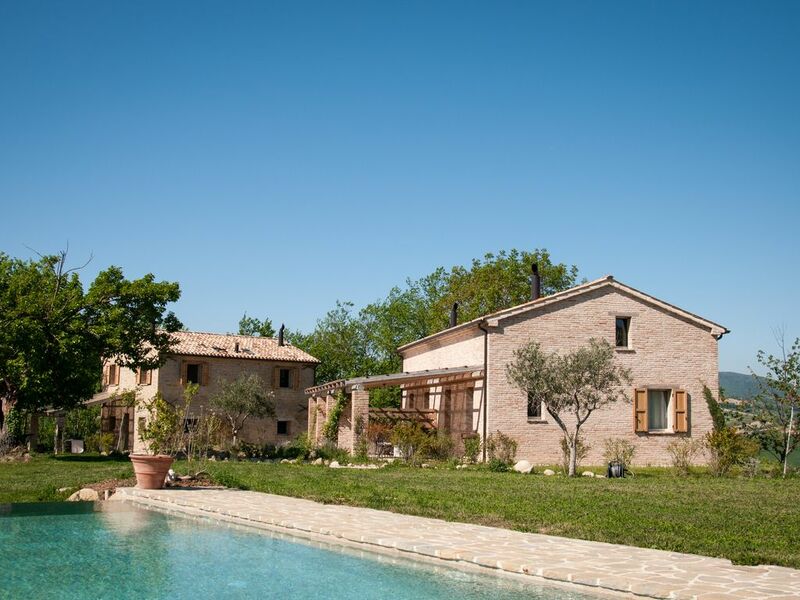 Cozy and relaxing apartment, on a size of 53sqm, in Italy - Marche, ideal for 2-4 guests, nestled in a small resort "Borgo Farneto" with a total of 4 ground floor accessible apartments in two houses with shared pool. Reopening 2016. The apartment is because of the high quality design not only in summer, but also in autumn, winter and spring very comfortable (underfloor heating, wood stove and well insulated air conditioning windows), especially as the Marche is an ideal recreation area for all seasons. The construction and equipment of the apartment was carried out high quality and built with natural materials. The furniture in the style of "arte povera" should be a reference to the local architecture and peasant tradition. Each of the four apartments is assigned an individual and covered loggia in the open as a lounge and dining area. The pool is exposed with its infinity edge with a beautiful view of the hilly landscape of the Marche.